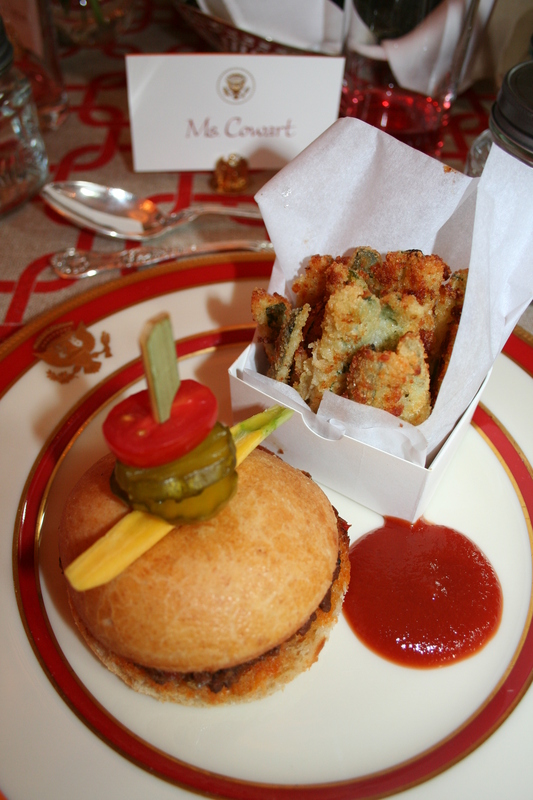 I have had lots of requests for the Baked Zucchini Fries recipe ever since I posted this photo from the Washington DC Kids’ State Dinner. I’ve had a lot of requests for this recipe for Baked Zucchini Fries, ever since I posted this photo on my blog and on Facebook recently. It being zucchini season, it’s a perfect recipe to make at the end of the summer, and really throughout the year. We actually made this recipe at the end of the summer ourselves, using a garden zucchini. They were delicious and they were easy. We used the recipe in our new The Healthy Lunchtime Challenge cookbook that epicurious gave us at the White House dinner. The recipe comes from Sydney Brown, age 11, from North Carolina. She submitted it with her winning Homerun Meatloaf Burger recipe as the side dish to accompany the burgers. There are so many recipes in this cookbook that I want to try out, and slowly but surely I’m trying them one at a time. This was a perfect summer meal! 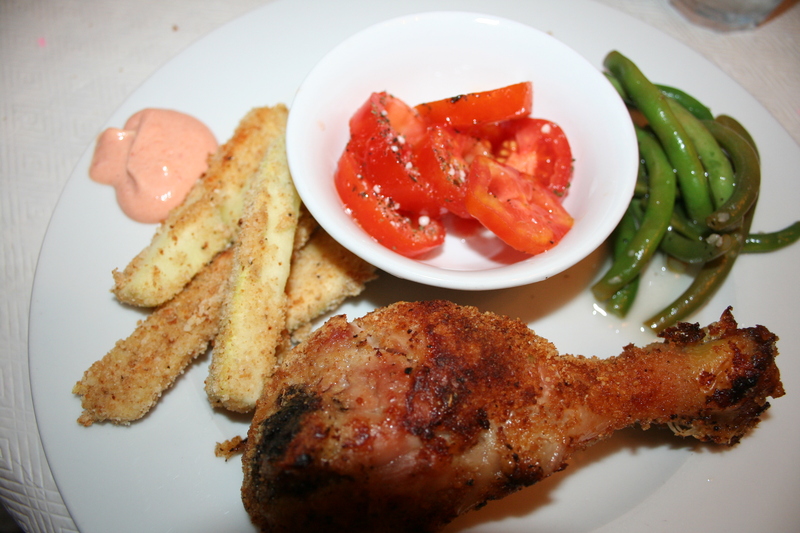 We had our fries with oven baked chicken, garden tomato salad, and green beans. Don added a dip on the side for the fries which consisted of a mix of mayo and cocktail sauce. Here is Sydney’s recipe, just as she has it in the cookbook. Enjoy! 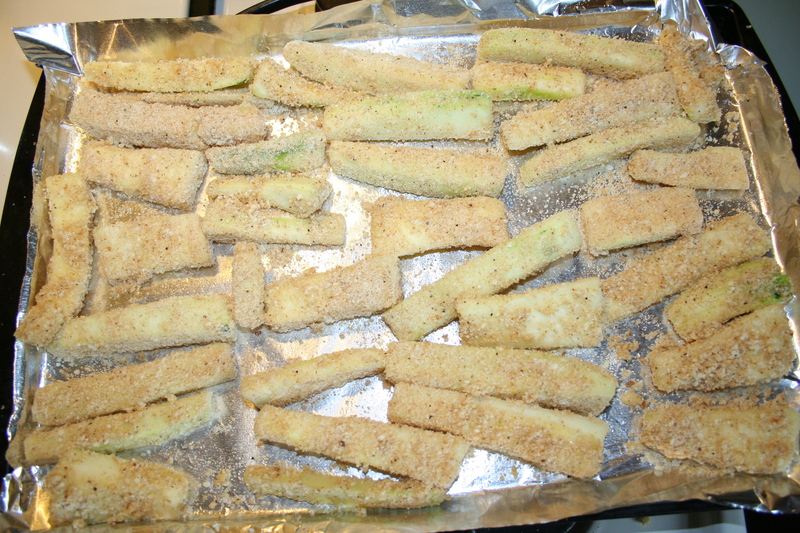 Place your zucchini fries on a baking sheet and bake in the oven at 425 degrees. Combine the egg white and milk in a small bowl and combine the Parmesan cheese, breadcrumbs, salt and pepper in another small bowl. Dip the zucchini slices first in the milk mixture and then in the cheese mixture. Shake off any excess, then move to the baking sheet and place in the oven. Bake for 10-15 minutes at 425 degrees. ← Couponing Update: Happy National Couponing Month!